If you’re thinking about switching from standard kitchen cleaners to ones that are ‘green’, there are a number of factors to consider before deciding what to buy. Product labels can be confusing and even items labelled ‘natural’, ‘organic’ or ‘eco-friendly’ can occasionally mislead you. The best way of knowing what to look for in a green kitchen cleaner is learning how to read and understand the label. There are a number of terms that are frequently used in the labeling of cleaning products. Many of them use cryptic, pseudo-scientific language in order to hide the true meaning of the product’s contents. Getting to know what each one means will help you determine what products are green. On the surface, the active ingredient is the one that provides most of the cleaning power. When you see any product that has an active ingredient, it means that the rest of the ingredients are largely unimportant and are only there to make the active ingredient usable. If the active ingredient is unstable, it has to be mixed with stabilizing ingredients; if it has a short shelf life, it’s mixed with preservatives to make it last longer. Active ingredients in cleaning products are usually antimicrobial pesticides, so if you’re looking for a green kitchen cleaner, you should avoid all products that have active ingredients on the label. In today’s world, consumers are obsessed with eradicating every kind of bacteria in the home. The problem is, only certain types of bacteria are harmful. Turning our homes into a completely anti-bacterial environment can actually be detrimental to our health, as it weakens our immune system. Think of the early Travolta film ‘The Boy in the Plastic Bubble’ where Travolta cannot survive outside of his plastic, bubble-like, anti-bacterial environment. The moment he steps outside his bubble, his body cannot handle the normal germs in the air, and he reacts violently. When you see “antibacterial” on a cleaning product, it’s tempting to think it’s a good thing, particularly if you’re looking for a kitchen cleaner. The kitchen is the area where you’re most likely to come across harmful bacteria such as E. coli and salmonella, so it’s understandable that you would want a cleaner that kills such bacteria. However, when a product is listed as such, it almost always contains pesticides, as these are the active ingredient that kill bacteria, viruses, and molds. If you’re looking for an authentically green kitchen cleaner, it’s best to avoid anything that calls itself antibacterial. Biodegradable means that the packaging of the product decomposes over time. In a bid to market cleaning products as eco-friendly, many companies label their product as ‘biodegradable.’ The problem is that no one regulates the use of the word on such products, meaning that pretty much anyone can say their product is biodegradable. There are no guidelines as to what biodegradable really means: does it mean it breaks down in one year? Two? Five? Hence, don’t be tricked into buying that you think is green just because it claims to be biodegradable. A chlorine-free product doesn’t contain chlorine bleach. However, this doesn’t necessarily mean the product is bleach-free: usually products that are labelled as chlorine-free use oxygen bleach instead. Oxygen bleach is thought to be a lot safer and non-toxic, so when you’re searching for a green kitchen cleaner containing bleach, opt for oxygen bleach instead of chlorine bleach. Labels use scientific names for their ingredients, so scan the ingredient list and make sure it says sodium percarbonate, sodium carbonate, or hydrogen peroxide, as these are the scientific variations for oxygen bleach. Flammable, or ‘combustible’ substances are easily ignited, so should be stored safely and never used near a source of fire. A flammable ingredient usually means some sort of solvent, which can often simultaneously be toxic, so exercise caution when buying cleaners that have flammable ingredients. Avoid any products that are corrosive, since these can burn the skin, eyes, and lungs. 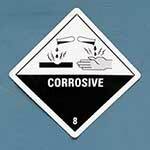 Corrosive materials are more likely to appear in foam oven cleaners than surface sprays or washing-up liquid. Luckily, there are natural ingredients that can easily tackle stubborn oven stains. 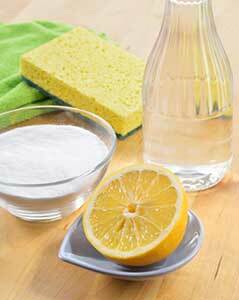 There are also recipes for home-made oven cleaners available online, most of which use baking soda and white vinegar. 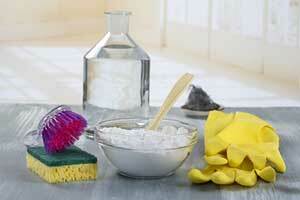 Before purchasing a corrosive store-bought cleaner, why not try making your own oven-cleaner? Enzymes are most often seen in laundry detergents, but a number of kitchen cleaners also use enzymes. Enzymes on their own are a natural substance thought to be relatively safe. Be sure to look out for boric acid appearing next to enzymes on the ingredient list, however; boric acid is often used to stabilize enzymes in cleaning products, and it is harmful to our reproductive systems. When we see ‘inert’ on a kitchen cleaner, we often think it’s safe. This isn’t necessarily true. Inert ingredients essentially are ingredients that aren’t pesticides. It should be noted that companies aren’t required to list inert ingredients on their label, so you might not even know what particular ones are being used. However, inert ingredients can often be preservatives, fragrances, or petroleum derivatives. The best thing to do in this instance is to only buy products that list every single ingredient. If the product doesn’t specify which inert substances are used, avoid it. Irritants can cause redness and itching to the skin or eyes. It’s less dangerous than a corrosive, but irritants should be avoided in kitchen cleaners because your hands often come into contact with them. This agitation can be circumvented if you religiously wear rubber gloves, but even still these chemicals are best to avoid altogether. The word ‘natural’, when used for a cleaning product, is completely unregulated. This means that any company can label their product as natural. Consumers can often be deceived into thinking natural cleaning products are better for themselves or the environment, but this is not always the case. Avoid products that call themselves natural yet have foreign-sounding ingredients that look like chemical equations on the ingredient list. Plant-based is slightly more specific: it means that the ingredients are derived from plants. This is a guarantee that there are no petroleum-based ingredients in the product, so quite often plant-based cleaners are deemed safe. Non-toxic can be an extremely deceiving term, considering the fact that there is no industry standard for the application of the term. Hence, be wary of evaluating products solely on the claim of being non-toxic. Phosphates can cause dangerous reactions when released into water. They are now banned in cleaning products, so when phosphate-free is included in the labelling it’s solely for marketing purposes, as most cleaners are now required to be phosphate-free by law! As a consumer wondering what to look out for in a green kitchen cleaner, it’s best to read the ingredients list closely and avoid the above mentioned indicators like chlorine bleach, toxic or corrosive chemicals, and products that contain active ingredients lists. Although our list is extensive, it is far from a complete list of all popular labelling gimmicks for cleaning and household products. There are a number of products on the market that claim to be green, but often regulatory bodies have lower standards than consumers in the use of the term. If you really want to ensure you clean your kitchen with green products, the best option is probably to make them yourself.